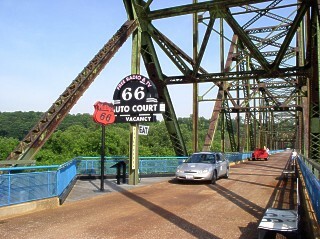 The Old Chain of Rocks Bridge, which spans the Mississippi River between Chocteau Island on the east and St Louis, Missouri on the west was built in 1929 as part of the construction of Route 66. One of the bridge’s most unique features is the bend located about half-way through it’s one mile stretch. Today this Bridge is the world’s longest pedestrian and bicycle bridge. The Chain of rocks Bridge is open for foot and bicycle travel year-round and opens for vehicular traffic during special car events.